"The film contains scenes of terror which link it not only to the popular cinema in general and to the horror film in particular, but also to European melodrama and stage gothic tradition. Disney is addressing an audience of both adults and children which makes the texture of the film particularly dense. [...] This address is part of the Disney feature films' layered texture; it disappeared when the Disney studio identified itself with a distinctly younger audience in the post-war era. At this early stage Disney was taking on the role of a complete story teller, absorbing the gothic tradition from Europe via the German expressionist cinema as well as the rise in popularity of the horror film in the early days of sound." - Robin Allan, Walt Disney and Europe. Snow White and the Seven Dwarfs premiered in 1937 as the first American feature-length cartoon; it went on to run for years around the world, grossed eight million dollars in the pit of the second wing of the Great Depression, and became a beloved cinema classic. It is a ruthlessly terrifying film, probably the most frightening thing outside of the studio's next project, Pinocchio, to be regularly presented to children. 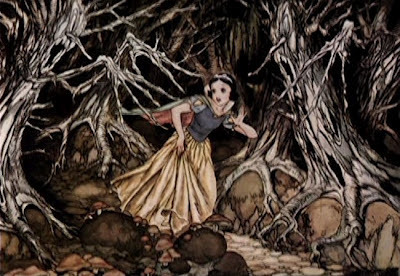 As his first feature cartoon, Disney was unsure how audiences would react to the emotional plights of cartoon characters, and so everything in Snow White is heightened: romance, comedy, grief and horror in brief snatches, one after the other, each emotion more powerful than the last, as the film barrels forward relentlessly free of fat or filler. Letters of complaint about the film's frightening effects poured in from around the country; Walt Disney ignored them, he knew very well that real threat was an essential element in fairy-tales. The English Board of Film Censors, who had banned all horror films outright in 1934, did let Snow White play unmolested and the British public reacted with an unusual furor. Over in Italy, the Mussolini regime had similarly banned all terror films and an entire generation of young Italians were caught totally unprepared for famous scenes like the flight through the forest and the queen's transformation. In twenty years, these Italians would come of age and start making their own horror films in the post-war era... films invariably influenced, in some way or another, by Snow White. What is the strange link between the motion picture cinema and the cinema of imagination produced by the ride-through attraction? In both we sit in the dark as helpless witness to a surprising experience that barrels along towards an inevitable conclusion. The horror cinema and the midway dark ride are especially fully linked - the nightmare images, the lurid pace, the sudden shocks. This is a cultural vocabulary which was fully exploited by the first few generations of Imagineers, those who excelled at creating experiences of terror and awe in equal measure. Disneyland premiered in 1955 as the first American fully-realized theme park; of course Snow White was present. 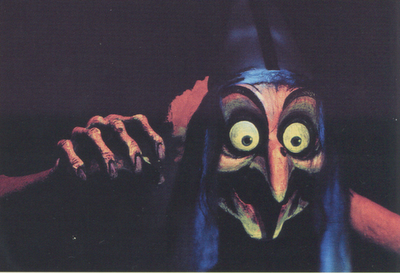 Snow White and Her Adventures was one of the very first dark rides to make extensive use of ultraviolet light, and it absolutely continued the Gothic traditions of Snow White: much like the film, a light opening sequence gave way to vultures, skeletons, and a flight through the forest. 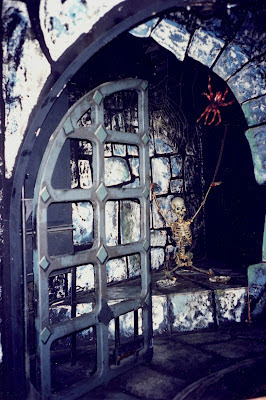 The 1955 Snow White ride began in the diamond vault for a view of the dwarfs at work; Dopey appeared to open the vault door and also appear with a sign reading "BEWARE THE WITCH!". 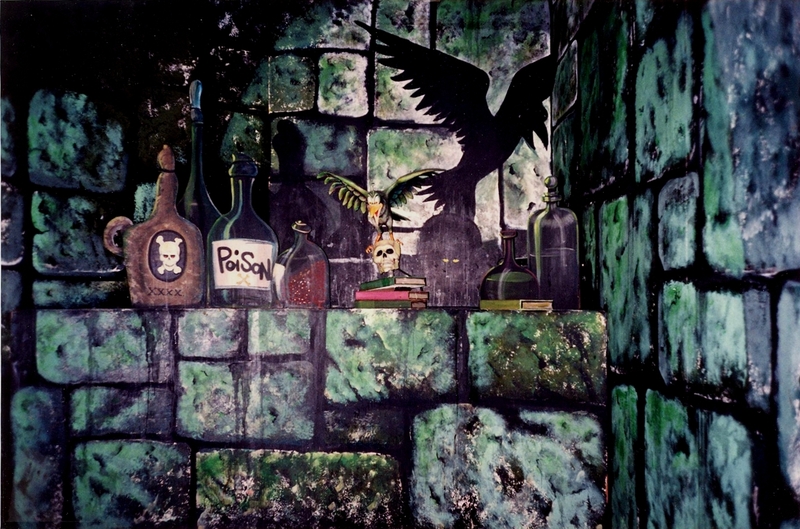 Exiting the vault, riders rode past a mural depicting the approach to the dwarfs' cottage, only to (irrationally) detour towards the Castle of the Wicked Queen. Entering across a drawbridge, a porticullis slammed down in front of the car, blocking it from exiting, forcing a detour through the castle. After a trip through a dungeon where a skeleton warned you to "Go back! 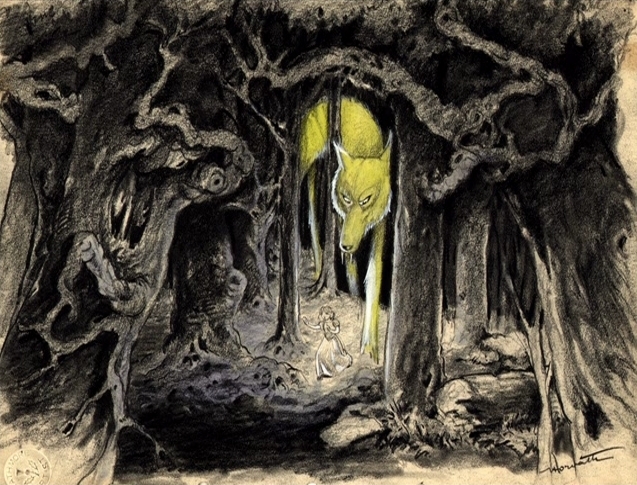 ", riders confronted the witch at her cauldron, fled through the Frightening Forest, were surprised by the witch at the door of the Dwarfs Cottage, and then narrowly avoided destruction at the hands of the witch, who was struck by lightning as she tried to pry a boulder loose from a ledge above. Over the years, more and more documentation of the original ride has emerged on the internet thanks to sites like Daveland and KenNetti, making it possible to place the ride in context of its' relationship to all other previous scary dark rides - striking a harmonious balance between the frights of Laff in the Darks around the country while forging ahead with a more leisurely, scenic style of narrative representation. Instead of a disconnected jumble of frights and laughs, Snow White and her ilk presented an accessible ride-through narrative experience. This is an even more remarkable accomplishment in light of the fact that the building for Snow White was not built to specifications - the ride designers were given a set space and fit their ride layout inside it, on site. Bill Martin laid out the track based on a list of scenes by Ken Anderson, who executed the scenery at Disneyland with Herb Ryman and Claude Coats, who painted right on the plywood walls and flats as needed. Many three-dimensional props and figures were cobbled together onsite. The entire ride was a unique, original work of art put together by famous Disney artists. 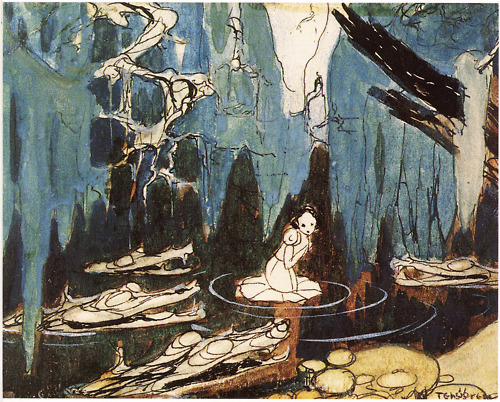 Snow White and Her Adventures was therefore a ride created much like a form of automatic writing - done hurriedly and somewhat thoughtlessly but revealing the artistic temperament behind the improvisation. 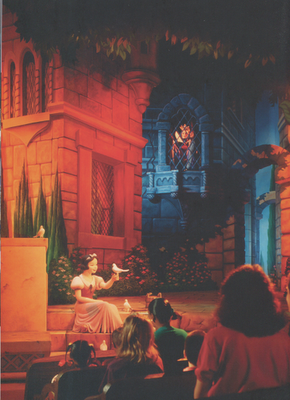 This was theme park ride as performance, and it is symbolically significant that the concept of a feature-length animated cartoon and the concept of a fully-realized themed environment were localized in the exact same moment by this attraction: just as Snow White led Disney into longform storytelling, she also led Disney into three-dimensional popular art. And so this is where our story begins, although it is not in any way the beginning of the story of the Disney Snow White. The subject of our story today is the 1971 Magic Kingdom original attraction Snow White's Adventures, the second fully realized Disney Snow White ride, which is a genuine forgotten classic. As I will attempt to show, the ride is both important, influential, and artistically significant, although she was perhaps a little too early to the party of Magic Kingdom extinctions to get full recognition. Plus, she was scary, and not in a fun way like the Haunted Mansion, but genuinely blood-curdling and weird. I will also attempt to show how important the 1971 Snow White has been for each subsequent version, of which there are three pedigrees, all of which share some common links with the 1971 version and the 1955 version. It is a daunting maze, but one worth navigating, because the links are extensive, impressive, and relevant. So hop into your Snow White car (are they mine carts? Beds? What's the deal with those things anyway?) and let's take a spin in a dark, back in time, to 1971. One place to begin discussion of the 1971 Snow White's Adventures, as distinct from the 1955 Snow White and Her Adventures, is to cover the purely technical aspects related to it's advancement. Starting in 1964 with the formation of MAPO from what had previously been the Disneyland Machine Shop, WED Enterprises had an increasingly sophisticated, skilled, and technologically advanced crew to execute their in-house designs; instead of the crude handcrafted figures created for the Ford Magic Skyway in 1963, off-the-shelf standardized parts could be assembled into a reliable mechanical skeleton, fiberglass and plastic could be cast from molds to ensure predictable and replaceable body parts, and even rubber heads, hands, and gloves could be mass-produced to fit demand. 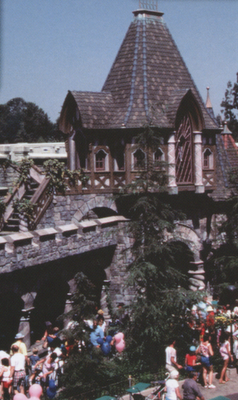 And so while Snow White's Adventures still ran Arrow Dynamics ride vehicles along a bus bar on the floor, it established for the first time a Snow White ride with scalable physical assets: most of the sculpting, scenic design, and props of this 1971 version became the template for all subsequent versions. 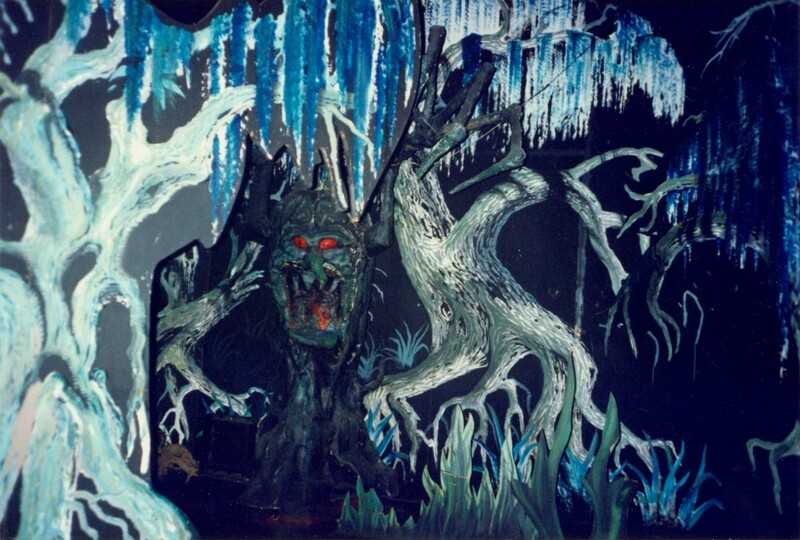 The WED sculpture staff, including such geniuses as Blaine Gibson and Adolfo Procopio, produced a number of beautiful in-the-round figures for the ride, including the Witch, a raven on a skull, six haunted trees, crocodile "logs", an entire cottage interior, and all seven dwarfs. This was in addition to a Snow White figure and a fleet of seven totally different dwarfs, plus forest animals, destined for the Mickey Mouse Revue across the street. A brief look at the difference between the handcrafted Witch figures in 1955 and the sculpted witches in 1971 reveals a startling difference. In addition to the purely technical advancement, the attraction had a new head designer: Claude Coats, who headed up development of the entire 1971 Fantasyland. The 1971 Fantasyland in itself was interesting in that most of its attractions were heavily stylized after the personal art styles of key WED staff: It's A Small World for Mary Blair, Mr. Toad's Wild Ride for Rolly Crump, Cinderella Castle for Dorthea Redmond and Herb Ryman. 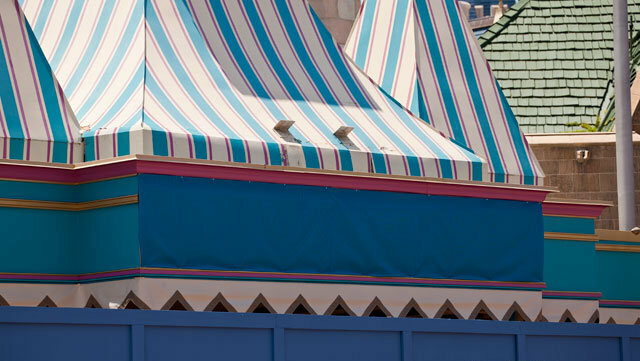 The styles of the 1971 Fantasyland facades were heavily patterned on the famous Eyvind Earle art direction from Sleeping Beauty. 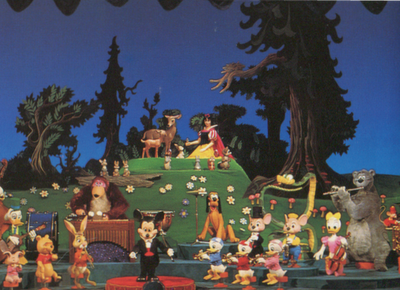 Both the Mickey Mouse Revue and Snow White's Adventures were painted in Claude Coats' personal style. 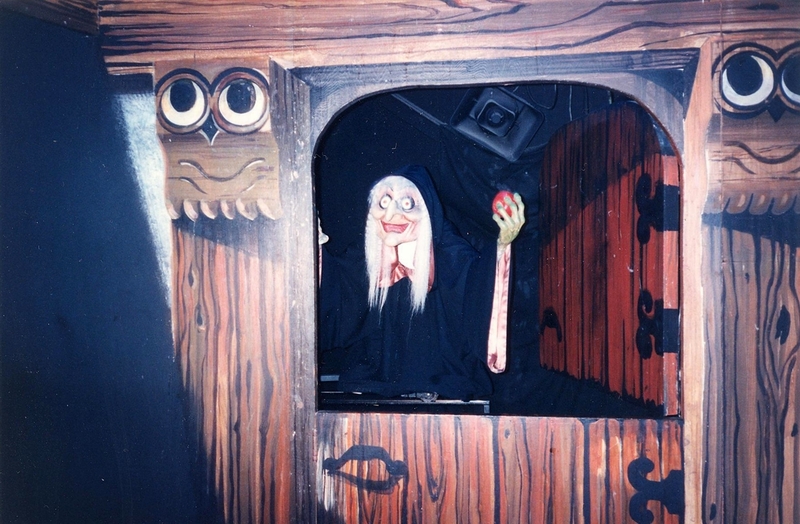 Coats re-ordered the 1955 ride radically while still retaining a good number of scenes and events; the ride still moved towards the Dwarf cottage only to irrationally turn away and enter the Queen's castle, the ride still visited the mine shaft of the seven dwarfs, still fled through the scary forest. But the emphasis of the ride was totally transformed. 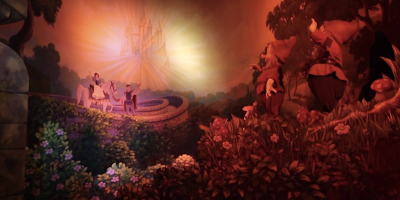 Snow White's Adventures kicked off in high style with a beautiful ride facade depicting the Wicked Queen's castle to the left, the Seven Dwarfs cottage in the center, and the Mine with its shimmering plastic waterfall on the right. The ride vehicles first circled a wishing well from which a rendition of I'm Wishing echoed; perhaps the only real clue in the entire ride that the riders are supposed to be inhabiting the person of Snow White! From there, the vehicles circled towards the little downscale dwarf cottage (exactly as in the 1955 ride a helpful sign nearby proclaimed: "To Dwarfs' Cottage"), turned away from it, and headed directly into the castle of the Wicked Queen, who parted a set of curtains to glare down at each vehicle as they entered. Inspirational moment from the 1937 film. 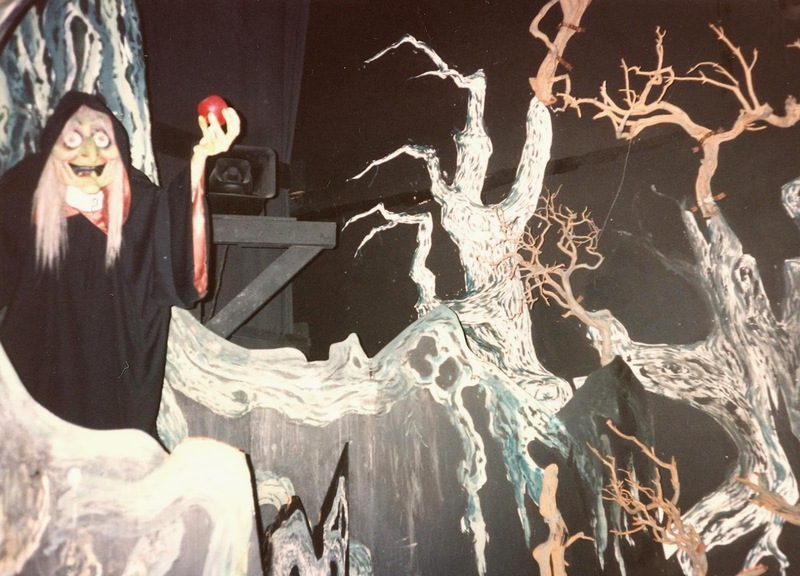 This version of Snow White's Adventures belongs in the very exclusive company of the best conceived and executed entrance areas of a ride ever. 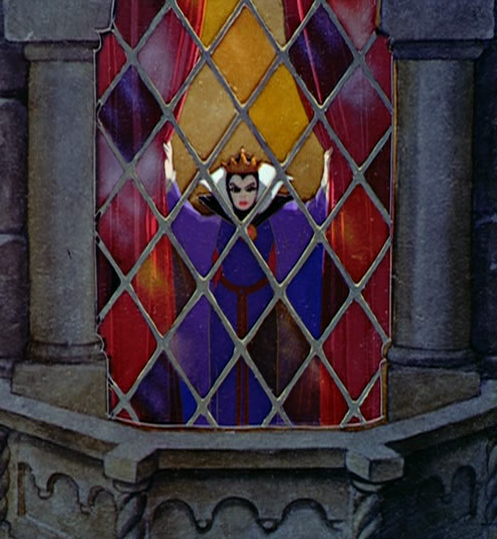 To begin with, much like the actual film, a very beautiful and light introductory statement hides darker things to follow; and, just as in the film, the Queen glaring down from a window puts us in the role of Snow White, whom she will have her revenge on. There's also no lie in this mural; the ride begins in the Queen's castle, ends in the Mine, and in the middle we will visit the dwarfs cottage -- if perhaps things aren't exactly as we expected! 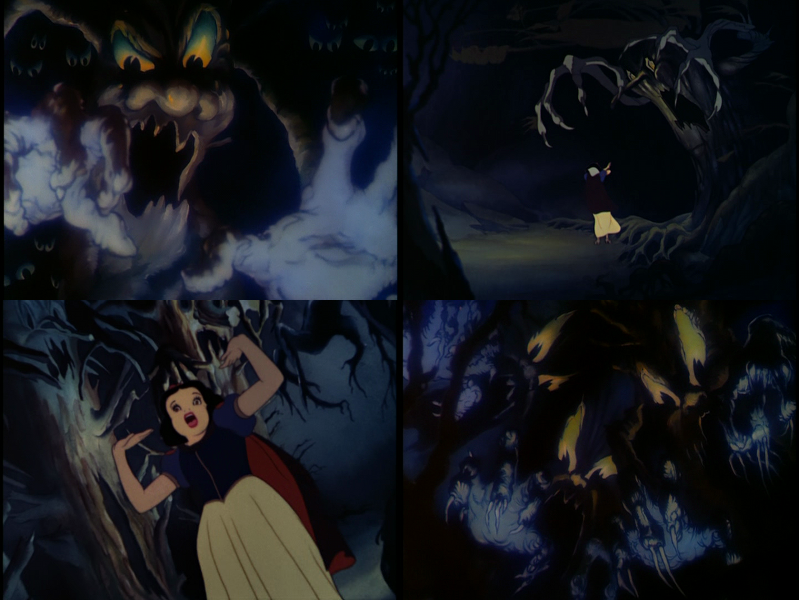 Perhaps, much as the film makes it quite clear that the ghosts of the forest are more in Snow White's imagination, the ride is our frenzied, terrorized imagined impression of the true nature of the world presented on the load facade: after all, the demon trees and crocodile logs of the 1937 film are clearly a fantasy. Or perhaps Coats was just messing with us. I elect the latter. Upon entering the Queen's castle, the cars move towards a large mirror which momentarily reflects both the cars entering and the scene around the corner, immediately creating a sense of confused space. This is a set-up for one of the ride's wickedest tricks; we see the Wicked Queen facing a mirror, her face seen only in reflection, as outside a long slender window to the right dark clouds cut across the moon. "Mirror, mirror, on the wall -- I am the fairest one of all!" The Queen's reflection vanishes as she turns to face us - already a gruesome hag -- and her statement ends as a shrill shriek and cackle, sending us off into the dungeon. The night sky outside the castle "window" is an interesting touch, because dark clouds over the moon is a horror movie cliche and hints at the dark deeds to come. It also reminds me of an shot of the moon near the start of Buñuel's Un Chien Andalou, which it recalls very closely, an unintentional but not inappropriate link given the nightmarish yet faintly absurd nature of the ride to follow. The Throne Room scene is a neat trick as it both establishes the Witch's intention - to do us in! - and makes it clear that the ride will play by nothing resembling "rules". 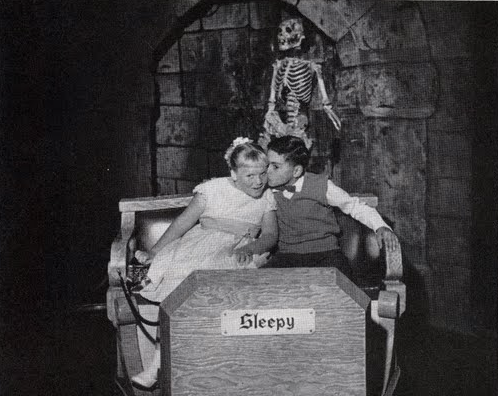 Although I have no specific evidence of this, I suspect that this mind-bending gag and several others in the ride are the invention of resident genius Yale Gracey, who with Rolly Crump performed a significant refurbishment on the original Disneyland ride in the mid-60s. Gracey and Crump were the first to install "floating eyes" in the frightening forest thanks to one of Crump's mobile contraptions; an updated version will shortly appear in this 1971 ride. Inside the dungeon, the cars zipped past two chained up skeletons, the first of which flapped its jaw - just like it's 1955 counterpart - and warned "Go back!!" while another moaned eerily as a bright orange hued spider crawled down it's web towards the cars. From the darkness, dozens of green rat's eyes blinked and an iron gate swung ominously to and fro. Another clue to Gracey's involvement in the attraction, the rat's eyes were imported directly from the final scene of the Disneyland Pirates of the Caribbean, and later would be used to represent bats in Big Thunder Mountain Railroad. 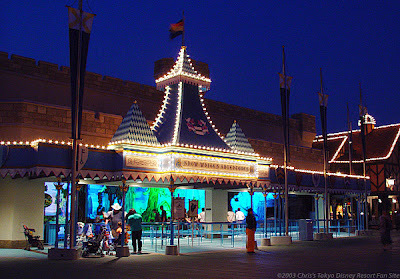 One reason for this scene's perpetual darkness is that this short dungeon is the point where the ride's spur line, leading to vehicle storage, branched off the main track. 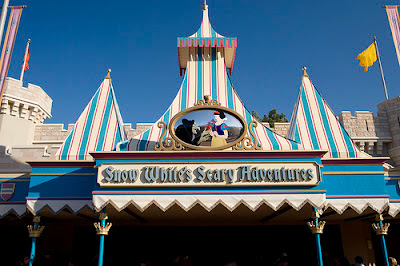 At this point it's worth commenting on the sound of Snow White's Adventures, which was to my young impressionable mind amongst the most upsetting things about it: most of the ride took place in comparative silence, with no recognizable music from the film, to speak of. It was spare and relentless, allowing the Witch's cries of "Mirror, mirror, on the wall -- I am the fairest one of all!" to echo through all of the dungeon scenes and part of the forest, creating a paranoid atmosphere where one was never certain if that cackling witch was in front of you, behind you, or right up upon you before you even knew it. "Have an apple dearie?" 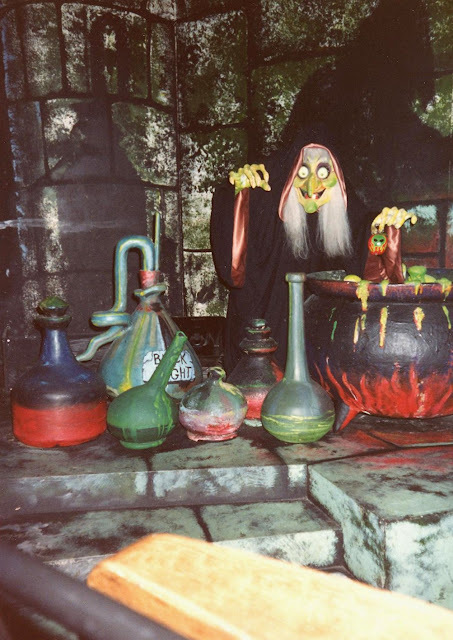 As we turn away from the witch, a shelf of potions above our heads comes crashing down with a terrifically loud glass shattering sound - a classic dark ride gag, and very effective. Notice the shadows painted directly on the wall - a classic dark ride trick which harkens back to The Cabinet of Dr. Caligari. Escaping the shattering glass, the cars moved outside and alongside the castle's moat, with crickets singing in the darkness. Of course, just moments after taking in the very elaborately painted scene, the Witch came rocketing out of nowhere on her boat, cackling and offering the poisoned apple. 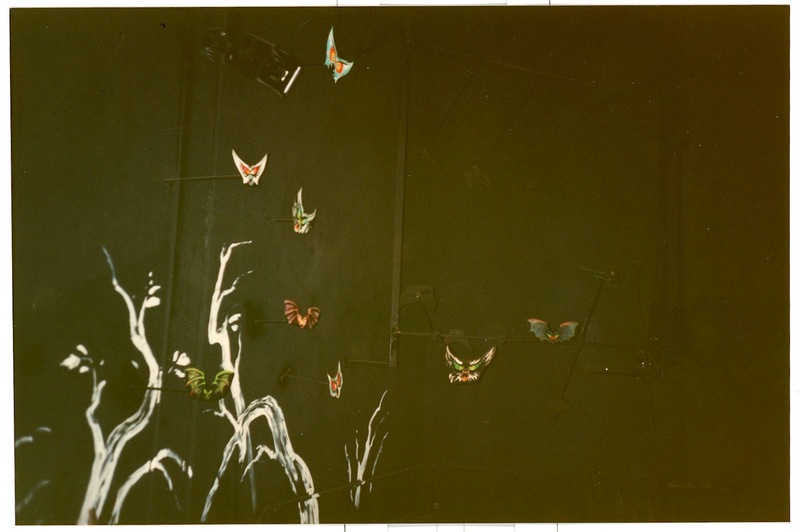 This is a publicity still of the scene, which sadly must be sourced from a degraded 8mm home movie sold in the park as a souvenir, called "Fantasyland at Walt Disney World's Magic Kingdom". 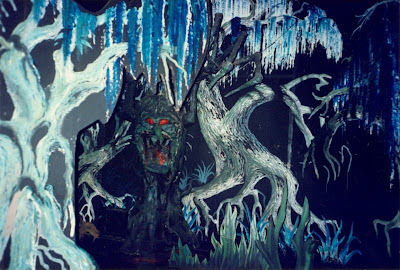 Still, it allows us to appreciate the scenic beauty of this briefly glimpsed set; the castle wall past the opening of the arch is actually painted on the rear wall; the reeds in the lake are standing flats on the floor, and the first of four "log crocodiles", with glowing eyes, may be seen to the right. Sadly not visible is the beautiful painted backdrop of swirling clouds which vanish into darkness off to the right. Onwards to the frightening forest, which may have been the ride's piece de resistance. Inspired by the famous sequence in the animated film, the flight through the forest is the quintessential "ghost train" sequence of any Disney attraction. The sequence of the film which terrified a generation. 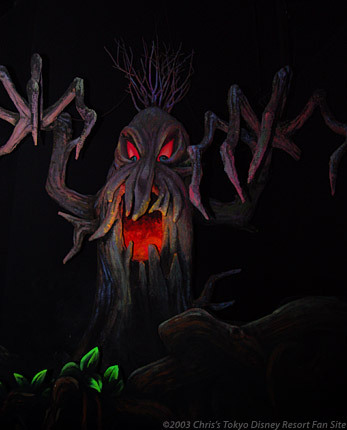 Coats' on-ride forest is populated with frighteningly ghoulish trees and "scored" with crickets, moaning banshees (direct from Chilling, Thrilling Sounds of the Haunted House), and atonal music much like that heard in the Florida Jungle Cruise. These are also replicated pretty faithfully from the film, although perhaps making them seem to be bats was a Crump (or Coats?) invention! At this point the ride vehicles saw perhaps the first comforting sight of the entire ride thus far: directly ahead, the cottage of the seven dwarfs! Warm yellow light spillt from inside the cottage, and the ride seemed to offer for the very first time the possibility that we could finally arrive at the safety of the cottage we had turned away from in the first moments of the ride and the nightmare could end. Yet the cottage is dark and silent inside. The abandoned dinner table, chairs, ornate carvings and even the water pump seem to stare at you with terrified burning white eyes. Around the corner, a number of forest animals are clustered in an open window, looking off to the right in alarm - another repetition of the ride's structuring motif of an indirect lead-up to an uncanny event. The next scene is uncanny indeed -- it's probably the most bizarre thing to ever appear in a Disney dark ride. All seven dwarfs appear to the right ascending the cottage stairs. Dopey, holding a candle in his shaking hand, is being prevented from fleeing the scene while Doc, leading the way, is protectively holding the rest of the dwarfs back near the top of the stairs. In the upper landing, an upstairs door is open, from which spills yellow light and the huge rippling shadow of a looming ghost! Our attention drawn to the top of the stairs, we are ill prepared for the sudden appearance of the Witch, sliding into view in an open doorway. "Sleeping apple?" To escape, the cars barrel directly through the wall. 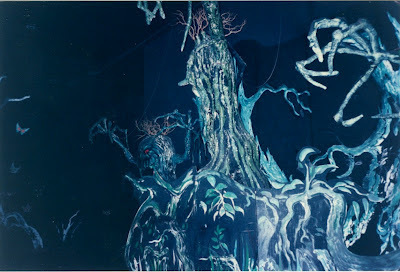 The fact that Coats would zero in on these minor scenic details and "expand" them into an entire scene is telling, but who else but the man who made the interior of the Haunted Mansion a disturbing panoply of leering skulls would take the extra initiative to make sure all those Gothic little eyes glow white and look directly at you? In the "staircase" room, the eyes of the little carved owls on the end of the steps and above the door (see above) are all painted to "look" at the shadow of the ghost on the wall. The scene of the dwarfs on the stairs is of course patterned on one in the film where Dopey is dispatched upstairs to investigate who is sleeping in their beds, and the appearance of a yawning Snow White underneath a sheet does suggest the looming ghost seen on the wall. But the scene in the film is played for laughs, with broad slapstick, since we already know that the "ghost" is a harmless young girl. In the ride, since we are Snow White and the shadow cannot be the Witch, who lurks nearby, a possible (disturbing) conclusion is that the dwarfs are again reliving the situation in the film - and this time it really is a ghost. 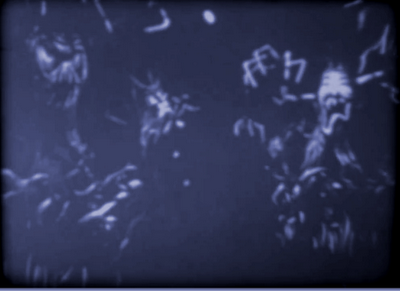 Have the demons of the forest found their way inside the house? Regardless, the dwarfs as possible figures of aid prove to be both elusive and helpless. They are not seen again during the ride. Notice here how real, dimensional branches have been appended to painted flats to give the scene some life. See the Witch's hands? Those were actually sculpted for the Haunted Mansion - they appear prying up coffin lids, doors, and on the banshees which circle the ceiling in the ballroom and ride bicycles in the graveyard. The Witch figures in this ride are quite economical - they hardly move, usually sliding into view on rails or boats or being revealed by strategically placed scenery. The feeling of a real persuit being underway is remarkable for being achieved primarily through scenic design and track layout. For those keeping track, this is the fifth Witch figure, and the second time she's popped out at you in a ten-second span. The cars head into the Seven Dwarfs Mine, which is dead silent except for the ominous creaking of timbers. One passage to the right seems to lead off into the far distance. The cars turn to the left and proceed down a long straightaway, until the Witch suddenly appears on a ledge above and shoves a crossbeam off it's support columns! This one is especially ghoulish, with its single red eye and painted splash of light on the rear wall. As you zip away, almost too fast to see her properly, columns to the left and right sway omniously as if a cave-in is imminent. At the end of the tunnel we see the mine tracks continue around a corner, but before we reach them, the witch cackles from out of sight and a mine cart loaded with glittering gems comes racing into view and stops just short of colliding with us! At this point the Witch has ceased simply appearing and offering an apple - she's made two attempts on our life in the space of a single scene! That's four serious threats and shock appearances in a 30 second span, and the feeling of real danger and irrational pursuit it truly underway. Notice, too, how vivid and hallucinatory the colors have become. 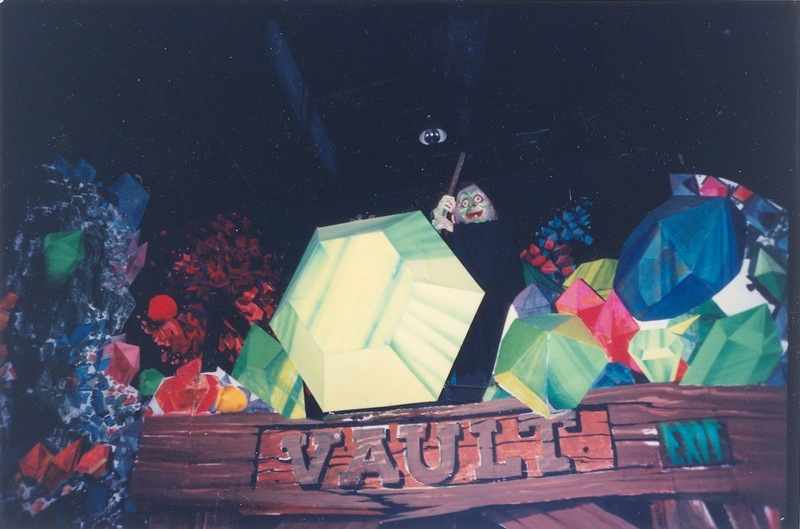 The vibrant colors and gem cart subtly set up the largest and most beautiful scene in the ride... the Diamond Vault. 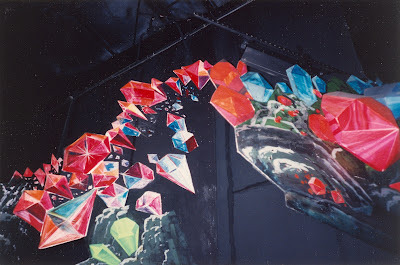 Across all of the walls pulsating, beautifully colored gems emerge from the rockwork. Directly ahead is a wooden door labeled "VAULT", and delicate, but atonal music plays, like gently plucked harp strings or droplets of water falling into a puddle. This was the scene in the ride nobody forgot, and it was suddenly and shockingly beautiful. As we roll forward towards the wooden doors, we pass under an elevated outcropping of rock and see, hidden from our view as we entered, the Witch is already atop the door to the vault! She pries a massive gem out of the rockwork above our heads and it falls towards us as we pass underneath. At this point the Witch shrieked the most memorable two words to end any attraction: "Goodbye, dearie!" The cars then passed into a small dark room with "starburst" explosions painted on the walls, illuminated by a strobe light, as the Witch's cackle, bizarrely distorted and sped up, echoed like a record with a skip: "Ah-Ha! Ah-Ha! Ah-Ha! Ah-Ha!" And with that, the cars rolled out of the darkness into the Florida sun, thus ending the freakiest two and a half minutes of your young life. Yes, that's right kids, the ride ends when the Witch drops a giant gem on your noggin and apparently kills you. Happy dreams. Oh, and please step out to your left! Perhaps the most remarkable thing about the ride is that it actually existed at all. There was a time period when I was convinced it was actually a fever dream of my youth. Who says Disney missed out on the psychedelic seventies? Perhaps it was actually an LSD apple? One remarkable aspect of Snow White's Adventures is how well it used very simple animation and motion gags to enormous effect: by concentrating on heavy atmosphere in place of constant character vignettes, nothing ever seemed crude or like it moved less than it should have. 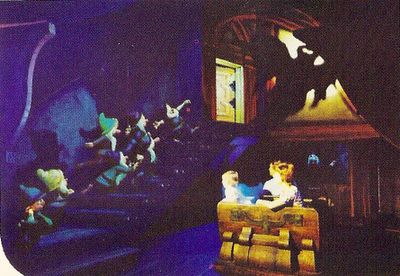 Many of the Witch's sudden appearances resulted entirely from the perspective of riders moving through the scenes; the figures themselves were often static props. Several, such as the crocodile logs which "chased" the cars in the Forest, could only ever be seen by a small number of riders. Additionally, even more than most "ghost train" style rides, the track layout here created a lot of the character of the ride; as seen above, it's obvious how the bus bar was laid in such a way to force cars to "leap" out of the way of each new threat, especially in the last third of the ride as the pursuit is really on. Few dark rides have ever been paced as tightly. What is apparent is that at a certain point the ride simply abandoned even the abbreviated version of the narrative logic of its first half: even allowing for a certain degree of artistic license compressing the transformation of the Witch into the throne room scene, the ride was following the film up to a point: the wishing well, the transformation, making the poison apple, embarking on the boat through the woods, the arrival at the dwarfs' cottage. 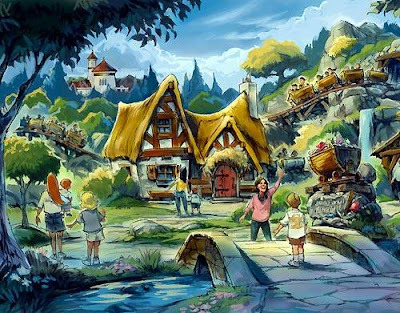 But the moment the cottage is breached the ride simply throws out the rule book more thoroughly than any other Disney attraction, building on riffs on abstract memories of moments from the film until the Witch literally goes on a murdeous rampage and kills you. What do you do with a ride like that? In Fantasyland? Mere steps away from Cinderella Castle, with a facade that suggests something far cuddlier than what it is, which is even more of a comfortless horror fest than The Haunted Mansion? 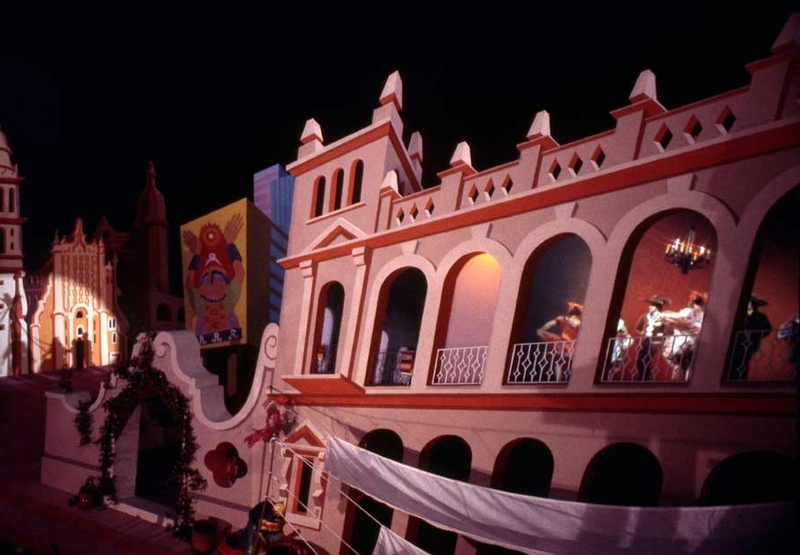 Snow White's Adventures and Rolly Crump's brilliant, adjacent Mr. Toad's Wild Ride held down the fort for nearly twenty years as strange, subversive pockets of irrationality and nightmare logic in Disney's orderly theme park world. Amongst the Fantasyland installation team sent from Glendale to oversee work on the Florida construction effort was a young guy from the model shop named Tony Baxter. Following what he later described as an "apprentice period" with Coats, Baxter went on to work with Coats on a large rebuild effort of the 20,000 Leagues Under the Sea attraction in 1974, and then rapidly ascended the corporate ladder in WED by overseeing Big Thunder Mountain Railroad, numerous Disneyland expansion proposals, several aspects of EPCOT Center and the 1983 Disneyland Fantasyland reboot. Baxter always positioned himself as a Fantasyland expert, and it is his version of Fantasyland at Disneyland and Disneyland Paris which most commentators believe is the best, most beautiful version. 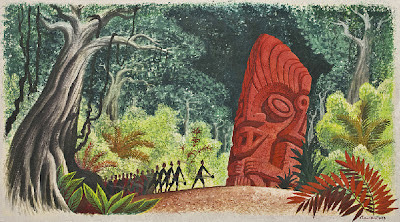 He also consistently and continually paid tribute to the Coats school of scenic design, inserting a full-on reference to Coats' Rainbow Caverns into Big Thunder Mountain (in addition to a swarm of those rat-eyes from Pirates and Snow White) and to Adventures Thru Inner Space in Star Tours. As we shall see, Baxter expended perhaps more effort than anyone else on recreating that original 1971 ride. Other elements to make the journey back West are difficult to track in this pre-home video era. 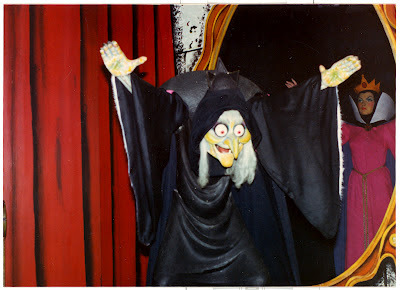 Kenneth Sundberg, on his KenNetti tribute page, has turned up an interesting photo showing a Snow White figure in place in the original ride in the 1970's... of course, the figure is struck from the same mold as the Snow White built for the Mickey Mouse Revue. There is no real evidence for anything like total figure replacement with the newer models for Snow White and Her Adventures, although it's not unreasonable to guess that besides the Snow White figure (who may have only been very briefly in place), minor figures like her forest friends or the vultures and skeletons could have eventually been replaced and made more like the newer models. 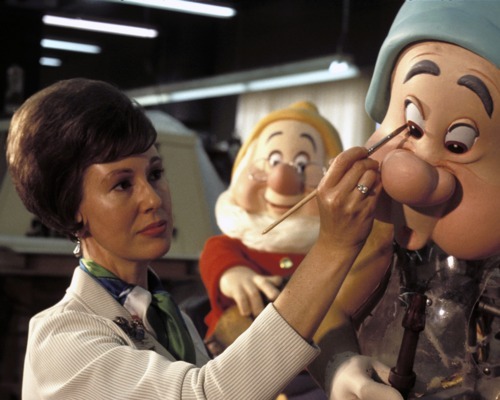 The 1983 Snow White reboot overseen by Baxter would manage to realize a full hybridization between the 1955 original attraction and its extremely unusual 1971 version, achieving an effective compromise between fidelity to the film and riffs on atmosphere and content. 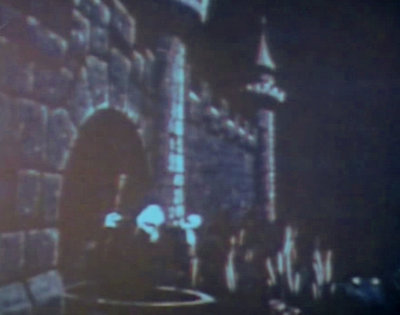 This 1983 version had two central mandates: introducing Snow White into the ride and dropping a stronger hint about the scary nature of the ride within. Baxter introduced a gothic stone facade and small pre-boarding dungeon scene to add a sinister element from the start, but the most famous and effective warning came direct from the Claude Coats version: positioned direct above the entrance is the same gag from the Florida loading area, with a sinister queen peeking out from behind curtains to glare at visitors below. The original incarnation of the gag may be gone, but its chilling effect lives on across the country. The 1983 version, now called Snow White's Scary Adventures, makes good use of the 1955 and 1971 traditions, figures, and sets. Some of its best moments recall the 1971 ride perfectly, such as prudent re-use of the "mirror transformation" gag (Baxter's team improves it a bit by having the Queen's "false reflection" spin around too, which is a further layer of deception), a sudden appearance of the Witch rocketing out of nowhere on a boat (the 1983 version replicates the 1971 castle wall set piece in almost every detail), and a mildly hallucinatory trip through the diamond mine, although this version is cheerful, not frightening. Other elements have been toned down considerably. The Witch figures look reasonably naturalistic and close to the film instead of the green-hued red-eyed creatures of the Coats version. 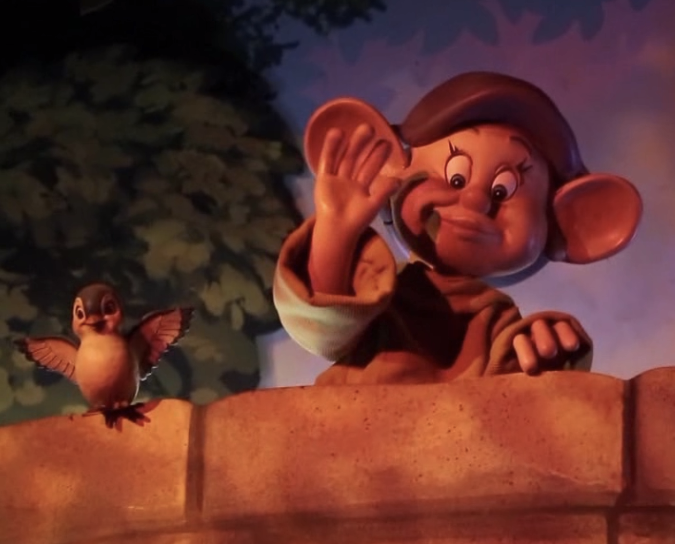 Snow White belatedly appears and is descended from the Mickey Mouse Revue figure, now holding a candle instead of a bird. The "Dwarfs on the Stairs" figures from Walt Disney World appear in the traditional "rock drop" finale, positioned so it now seems that the Witch is attempting to crush them instead of - as in 1955 and 1971 - the riders. There is a mine cart in the Seven Dwarfs Mine, but it does not attempt to mow us down. The trip through the frightening forest re-uses the Gracey/Crump crocodile logs and levitating eyes, but is considerably less intense than the 1971 ride. 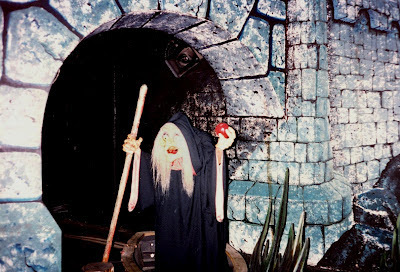 And reprising a Disneyland original gag, one which probably inspired the whole tone of the 1971 "Dark Cottage" scene, the Dwarfs Cottage offered only cold comfort as the Witch appears from inside offering a poisoned apple. This excellent 1983 vintage version has considerable suspense and strum und drang without seeming too much like a mean trick. It replicates the pace of the 1955 version pretty well, with a beautiful first half before things really go south in the Queen's Castle. It became the template for all subsequent versions, and is a classic in its own way. One of its very best effects is unintentional: without sufficient space for a proper denouement, the ride ends with a clap of thunder, a shriek from the Witch, and a sudden ejection into the unloading area with a mural which merely indicates a happy ending for Snow White. But it doesn't feel like the end, and it isn't: no matter how many times we ride, the Queen still glares down at us from on high above the entrance. The flight through the dark forest lasts forever. Coming conceptually after the 1983 Disneyland version, but chronologically before it - opening six weeks before Snow White's Scary Adventures - the Tokyo Disneyland Snow White's Adventures is the true "missing link" between 1971 and 1983, a weird alternate reality where the two rides went on to cross-pollinate each other instead of the 1971 version being pushed off the map. There is no particular evidence of who put this version together, but I would not be surprised if Tony Baxter was behind it, using the superior budget and space of the Tokyo project to craft a tribute to the attraction that obsessed him. If the 1971 Florida ride was like a crazy impossible psychedelia rock single, the 1983 Japan version is a loving tribute by a cover band. 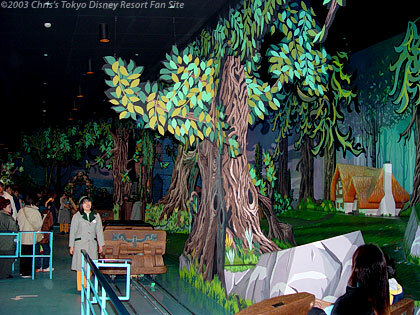 Most importantly, the Tokyo version takes pains to replicate the 1971 boarding area, with its gnarled trees, swirling clouds, and geometric landscape. It even replicates the shimmering plastic waterfall. Unlike the Coats mural of 1971, which was full of moody grays, greens, browns and blues, this version has a lot of pink and purple and can't quite match the furthest painted "depths" of the original, with trees that sort of fall off into far simpler Sleeping Beauty-derived geometric shapes and brighter colors and "textures" overall. But there is still a forced perspective dwarf house, a wishing well with a disembodied voice, and the blood-chilling moment where the Queen catches sight of you from on high, and those things are what matter. What follows once inside is at times very close to the Florida original. We face a huge mirror before turning to witness the Queen's transformation. The Frightening Forest sequence is nearly exactly the same, with the demonic trees, floating eyes, banshee moans and eerie music. There is an eerie mine shaft full of creaking timbers, pulsating blacklit gems and a mine cart which only threatens to run out of control and hit us. Other segments are direct from the 1983 ride. The extended trip through the dungeons takes the place of Florida's shorter but scarier version, and the Dwarfs and Snow White celebrate with the "Silly Song" inside their cottage, finally a true light on at the end of the forest. The ride ends with the 1983 cliff scene, and bizzarely interpolated just before is a static version of the "Witch inside the Cottage" gag from the 1955 ride - it must have impressed Baxter. This version is interesting if perhaps frustrating. It includes the best parts of both rides but in the process can't find a consistent tone - it's neither as much of a horrorshow was the 1971 ride or as much of a storybook at the 1983 ride. A ride for Snow White completists and the curious, it's the only place left in the world where some of the power of Claude Coats' 1971 achievement can be experienced firsthand. It would be ten years before another Snow White ride would open. Blanche Neige et les Sept Nains, at Disneyland Paris, is extremely close to the 1983 Disneyland ride, with some improvements. The forest has dancing fireflies, there is a proper happy ending, and this time Baxter able to make sure that that mine cart would roll forward and stop just short of crashing into riders exactly as it had in 1971, with the same sound effect. That inspirational (some would say traumatic) mine cart would last only another two years back in Florida. In the 1990s in Fantasyland, frightening attractions were less likely to be looked kindly upon. 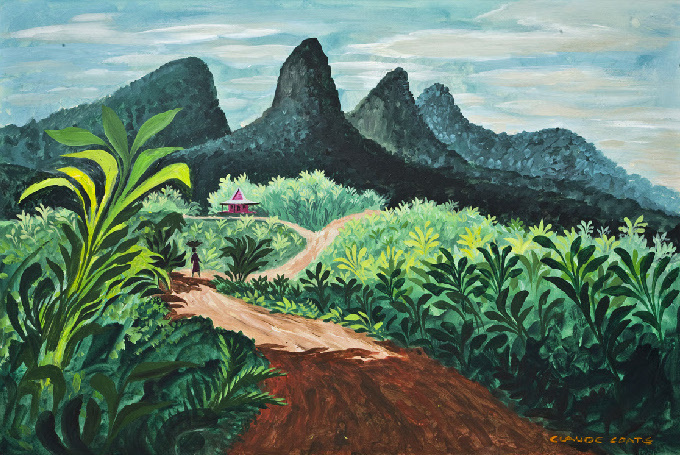 20,000 Leagues Under the Sea, with its terrifying giant squid, fled the coop around the same time as Snow White's Adventures and a new, brighter color palette of pinks and purples began to appear across the area. Snow White's Scary Adventures opened in 1994, an attempt to lighten the attraction considerably and tell something closer to a recognizable version of its original story. The beautiful load area was demolished except for the area immediately surrounding the wishing well and a new mural would cover up the rear area where the dwarf house once stood; this space was needed for the new opening (right) and ending scenes. 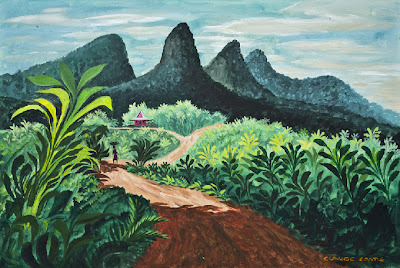 The style of the remaining Coats material was altered to be far more painterly and something like the sumptuous pastel watercolors of the original 1937 film; all of the stylistic independence of the 1971 version would be totally removed. The Mirror Transformation scene was reworked; riders now briefly faced the Magic Mirror, who set up the story with a bit of dialogue. Yet the Wicked Queen still faces away from us, looking in another mirror; which mirror is the Magic Mirror?? This Throne Room scene also has the distinction of being the only one to not begin with the Queen's eerie incantation of "Mirror, mirror, on the wall...". Instead she simply responds to the Magic Mirror: "Never!" and transforms, which simply doesn't fit the pacing of the scene that the track layout was designed to provide. 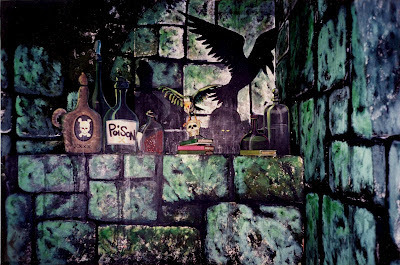 The dungeon was lopped in half, the Witch's laboratory now wedged into a corner previously occupied by a skeleton. The other skeleton was still there, but his jaw simply flapped sadly; the warning "Go back!" was removed. 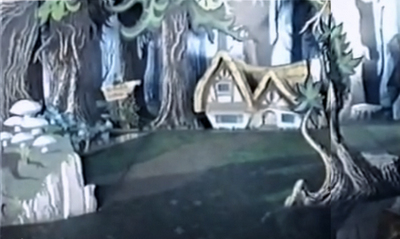 The former cauldron scene space was reused and became part of the forest; now the Huntsman appeared in two dimensional flat form to warn Snow White to "run away, and never come back!" 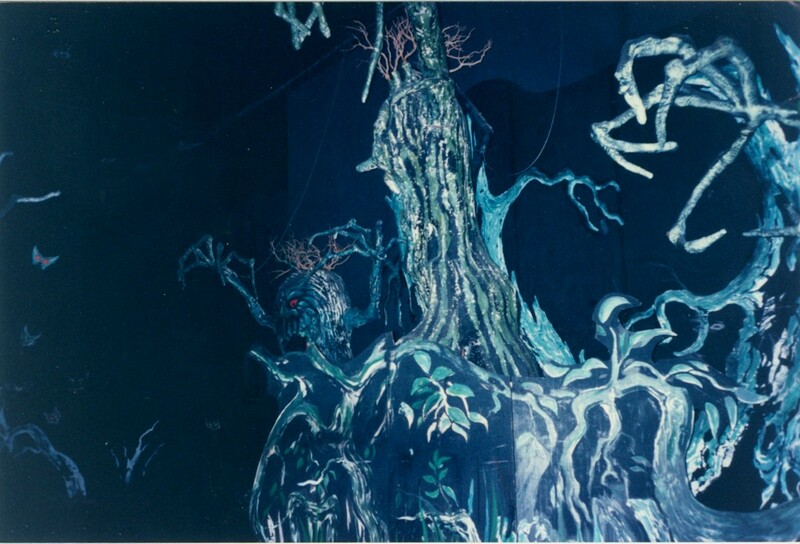 and a simple light-up scrim effect was used to make Snow White appear in a flash of lightning running through the forest; the attraction's first good idea. 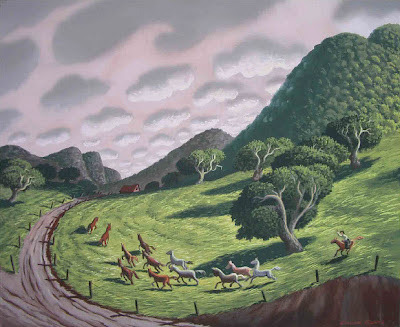 A much more sedate version of the Frightening Forest followed; the Witch glided slowly into view on a boat, and all of the Coats trees were painted over to appear less less menacing; one, which previously "fell" at riders, tilted forward ever so slowly. 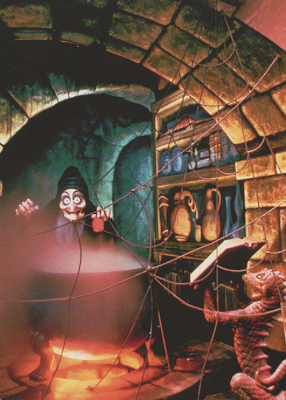 It's worth pointing out here that compared to the 1971 ride or even the fairly talky 1983 ride, the Witch here is a veritable chatterbox, explaining the purpose of the poison apple in the dungeon, explaining how she's riding the boat to the seven dwarfs' cottage, and on and on. The only thing the Coats ride needed to set itself up was a trip around a wishing well, a static figure peeking down out of a window, and twelve words of exposition: "Mirror, mirror, on the wall -- I am the fairest one of all! The dwarfs appeared to do their now-traditional Silly Song routine in the cottage, completing a cycle whereby those figures, sculpted for the 1971 Mickey Mouse Revue and re-used in the 1983 and 1992 rides, finally returned to Florida. Around the corner, the Witch figure had been bolted down in place in view at the window and the "basic" Snow White figure, now holding an apple instead of a candle or a bird, was present to be menaced. The stairs were still there but now unoccupied, but the scene felt weirdly unbalanced because it was designed and laid out in such a way that the movement of the cars naturally drew the eye to the staircase, which was no longer the focal point of the scene. "That's right dearie, now take a bite, and all of your dreams will come true! Ha, ha! Now I'm the fairest one of all!" That's almost twenty-five words coming "out" of a figure represented as a static prop in a room which felt very empty without the dwarfs on the stairs or the shadow on the wall, and the dialogue simply drew attention to the ride's weakest aspect: the nearly constantly static figures. This aspect is something the Coats and Baxter rides hid very well with staging and movement, but it was right out in the open from the first scene of this ride to the last. 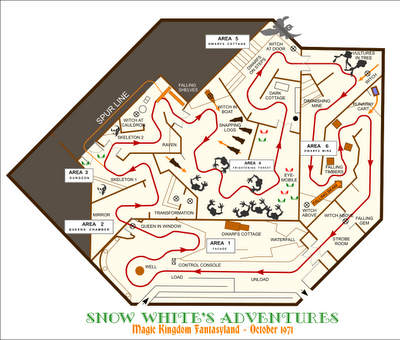 From this point on, the track layout of the ride becomes all new to fit in a few new scenes; no longer would the cars increasingly "jump" away from each new danger. Possibly not co-incidentally, this last third was the weakest part of the ride. 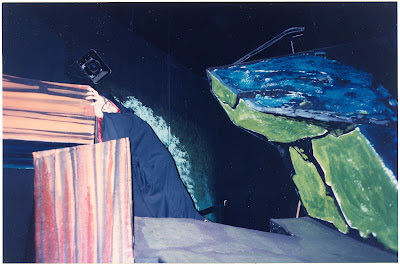 The Fifth Witch figure was now bolted down in place amidst a new backdrop of cliffs and rocks; a nifty lightning effect added some life to the scene, but not enough to disguise the static nature of this prop. There was then a brief trip through the Dwarf's Mine and the traditional "rock drop" finale, although two of the seven fleet of dwarfs were used in the mine shaft and not replaced for the cliff, making the scene feel weirdly depopulated. After a quick trip through the black-out room we came across the new happy ending: a static tableau of Prince Charming kissing Snow White on her funeral bier - a genuine new addition to the Snow White ride heritage! - and a final scene of Snow White and her Prince in a painted mural heading off to their castle, acceptably enlivened by a projected effect. Two, not seven, static dwarfs appeared to the right to send them off, and although I don't intend to be mean about it, these two dwarfs always appeared to me to be cast-off store display figures. Dopey waved from a bridge over the exit doors, ending the ride on a high note. Snow White's Scary Adventures of 1994 was an acceptable effort at making a less-scary ride out of one of the scariest, weirdest WED rides ever built. The fatal problem with the ride is that almost anything that moved in it was left over from the 1971 ride, which was full of motion - simple motion, but nothing like the static figures constantly "talking" which filled this one. I cannot think of any Disney dark ride with fewer moving props, with such a heavy feeling of stasis. The ride made an unfair impression of cheapness because of this. The overall impression was of moving past beautifully painted window dioramas instead of a fully realized ride. And the 1994 ride was beautifully painted, and this was truly the best thing about it. Every surface glowed with lush detail, carefully crafted perspective tricks, and wonderful colors - this was the reason to ride, the reason why it worked at all. The scenic shop really outdid themselves, with fascinating little details in the Dwarfs' Cottage, beautiful rays of sunlight in the finale, and blue cold stones and hanging curtains in the Queen's Castle. Despite running on "hardware" just as limited, the Coats ride succeeded above and beyond it because his version was more about atmosphere and setting than character - dark, twisting trees, grasping branches, swirling clouds, moonlight shining through windows, and eyes in the darkness - these are the "stars" of Coats' ride, where we are lost and alone in the dark, pursued by a Witch we only ever have fleeting glimpses of while the threat of the foe permeates the air all around us. Like the evil Yeti pursuing us downhill through the ice-caverns of the Matterhorn, our imaginations supplied the movement. In the 1994 version, which never fully exploited the wonderful track layout it was given, our imaginations never contributed much more than imagining a ride with a better budget. Snow White's Scary Adventures in Florida closed about a month ago, and the wisdom of this closure still has yet to be proven. 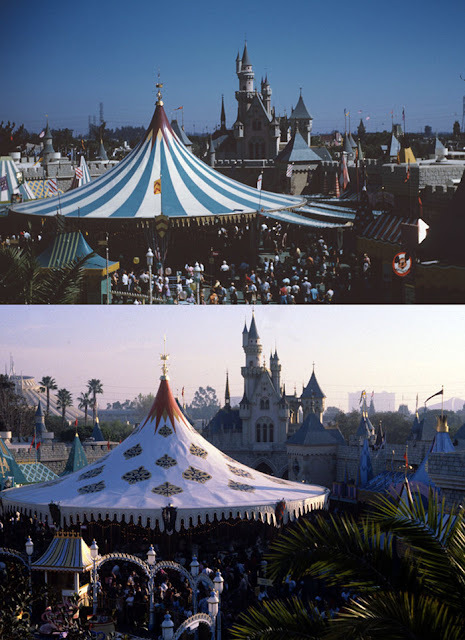 It certainly was not the 1971 ride, or even as good as the 1983 ride: neither quite appropriate for young children nor well-executed enough for adults, the ride none the less had fans and adherents. There is indeed something deeply sad about losing this tangible link not only with 1955, but also 1971 and 1937: one cannot tell the story of Snow White's Scary Adventures without telling the story of every version, the film that inspired it, and the fortunes of the Walt Disney Company itself. 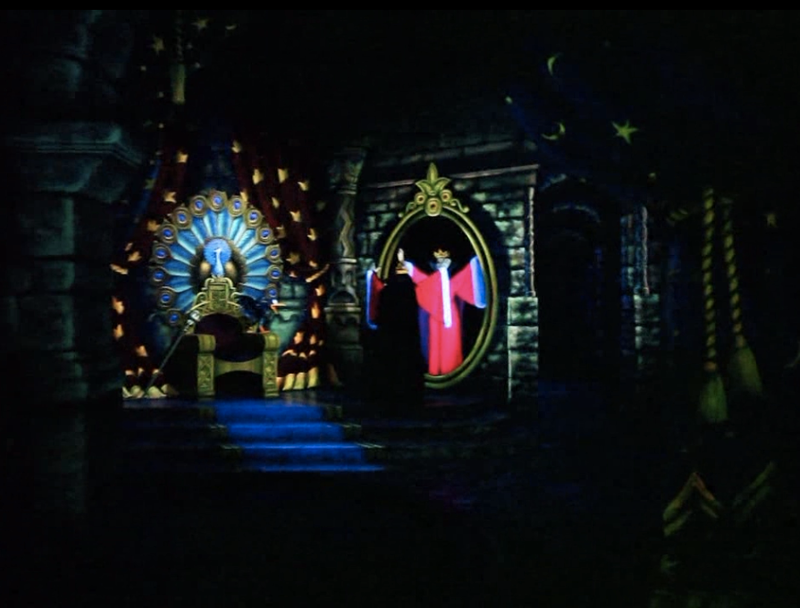 Despite the flaws of the 1994 version, it still enacted the rituals of the Snow White ride very well. That's what the rides truly are: rituals, ride through invocations. The offer of the poisoned apple, the flight through the forest, the dwarfs in the cottage, the threat of a falling rock - these are concepts which have submerged into the "cultural memory" of a Disney theme park experience, something that we have come to expect. The new ride, opening in Florida in the coming years as part of an overall expansion effort, will take the form of a roller coaster through a mine shaft and across meadows, lakes, and so on. It will certainly be a ride of greater general interest than a compromised form of an old dark ride. I have no doubt it will be fun and it will certainly be beautiful. But will it satisfy on the level of the scary old dark ride? Will the Witch offer us an apple? Will she try to drop a diamond on our heads? Right now, these are open questions. Although maligned and mocked by various wags for not being as sophisticated as most Disney offerings, Snow White's (Scary) Adventures is a very complex part of the history of the entire company, a very complex weave in a massive, growing tapestry. The space which it occupied in Florida, where legendary Disney designers at the height of the power of WED Enterprises crafted a bizarre and ruthlessly scary ride which has been the source point for all others which followed it, has now been gutted down to its wall studs and something new will shortly appear within. But that ride is one of those things that every Disneyland-style park has as a birthright. On the balance of evidence, I now humbly elect the 1971 Snow White's Adventures as one of the forgotten classics of classic-era Disney design. Few who rode it have ever forgotten it, and it casts a long shadow over the subsequent history of the dimensional representations of Snow White. At the heart of the Magic Kingdom, behind its' cheerful facade, was an inventive, strange and ghoulish dark heart of the Kingdom, direct from the fertile imagination of Claude Coats. Take a bite, and all of your dreams will come true! Very nicely written. It's hard to find much eloquence in opinion pieces, particularly related to Disney. It's usually "hate hate hate" related to WDW "attacks" on a writer's beloved ride. This, however, was well thought out and researched, and much appreciated! If you thought it was an amusing coincidence when we both blogged about rubber spiders around the same time, wait till you see the latest at Long-Forgotten. I always love your comparisons between the same attractions and themed "lands" between the different magic kingdom style parks. 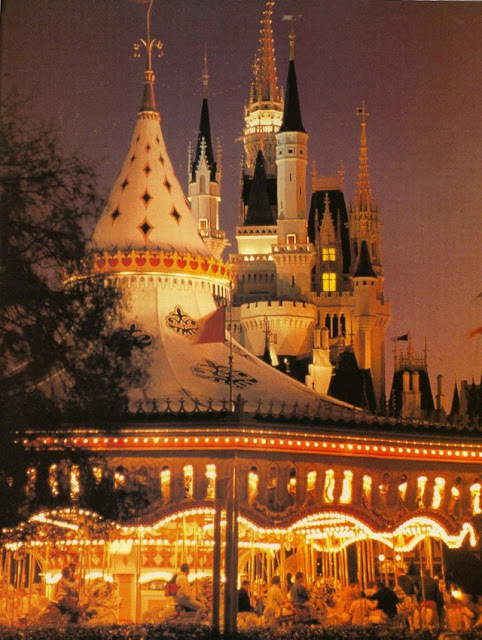 WDW's Magic Kingdom has definitely taken a beating when it comes to their classic Fantasyland dark rides. These are the heart of Fantasyland to me and I'm sad to see them go. Hopefully Peter Pan's Flight is popular enough to motivate the powers that be to keep it. Excellent ode to Snow White's Adventures. There is one not inconsequential aspect about this ride's creation: most people riding the 1971-94 ride hadn't seen the film, or had only seen it once or twice. (I rode this before ever seeing the movie.) You can get away with the scary and weird ride if people only remember being terribly scared as children whenever Snow White was released into theaters for its new-generational releases. Snow White was finally released on video for Christmas of 1994, and just about every American family decided to buy it. Now millions of children had watched Snow White nonstop and wanted a ride based on the movie, and would not accept a very scary and Snow White-less Snow White ride. Mr. Toad (a truly unknown character by the 1990s) could be reinvented in ride-form and accepted by the public that never saw his film, but once Snow White was on video and Americans considered it some kind of birthright to watch it, the 1971 version didn't stand a chance. What a fantastic post; I thoroughly enjoyed reading it! Well done! 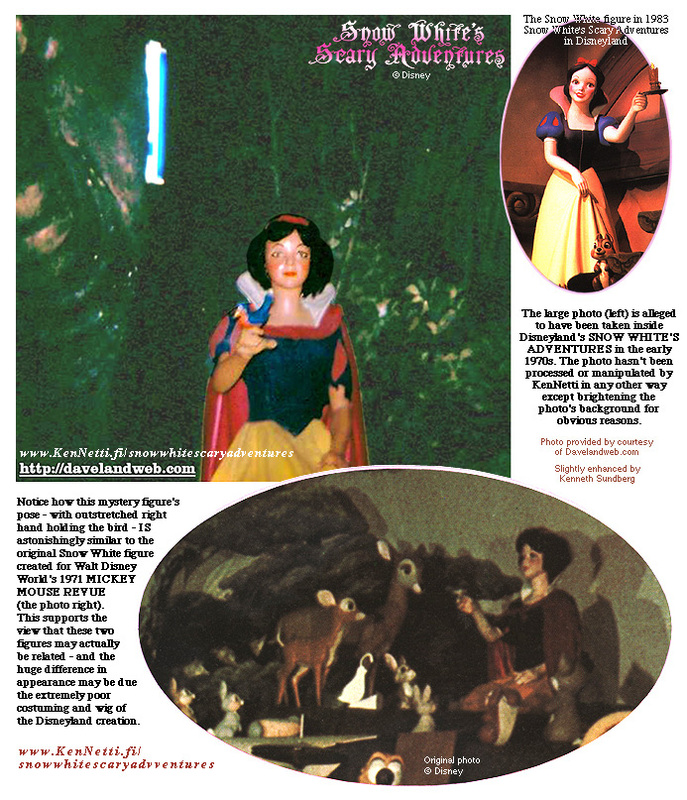 Absolutely outstanding post and pictures on Snow White's original ride at Walt Disney World. To me, that was by far the best version of the ride of all the various versions of it in the Disney theme parks. I have searched for years to find photos of those original 7 Snow White wicked witches. I would love to know how you obtained those photos. They were outstanding and the history and design and information about the Disney designers behind the ride was so insightful and completely enjoyable for reading. This is the ride and photos I have searched for years to find. Thanks so much and if other photos of the original ride come up, I hope you can find and post those too. I've mentioned to people before that the first time I ever went to WDW, in March 1974, I remember the ride having an ending that was completely different from any other version I've ever seen. It had the scene with the witch trying to drop the boulder (or large diamond, as on the video) on the cars below, but after that came a strange, anachronistic scene where the witch was lighting the fuse on a room full of dynamite and gunpowder; there was an explosion of strobe lights and then you crashed through the final doors into the outside. I've never seen any evidence that what I'm remembering is accurate! 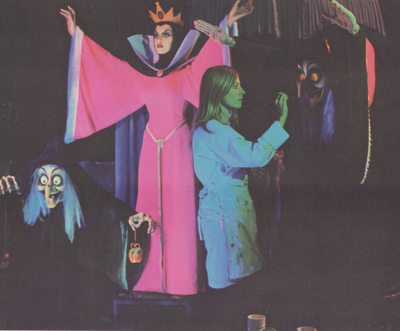 A friend of mine rode the ride in 1974 and explained that different ending of the original Snow White. Does anyone know if the original ending was different with the original version (1971-1993)? Yes, and those "burst" emblems painted on the doors are the exact same ones I remember as the climax of the explosion scene. The 1990 version doesn't make much sense, since the boulder (or giant diamond) doesn't actually fall, so how could it theoretically make the rider "see stars"? Maybe people complained about the explosion scene because there wasn't any gunpowder or dynamite in the original story! More follow up about the early version of Snow White at Disney World from 1974. Was the ending changed during the 70's? There is a youtube video from 1990 which doesn't have this explosion attempt by the witch. Any clues from any ride history buffs? Thank you, thank you for this wonderful article! I got to ride the original version of WDW's Snow White ride once right before they remodeled it. My group consisted of all adults, and when we exited, we all started laughing with exactly the response you posted: "What just happened?" The dwarfs' cottage was what I remember most, and thank you for describing it so well -- It was very unsettling, and brilliantly scary. The Witch in the 1971 version looks like Sarah Palin. LOL! And my favorite scene in that version was a tie between the beginning with the wishing well and the ending with the cartoon starbursts. "AHAHAHAHAHAHAHAH!" Yes, it was bizzarely distorted and sped up.